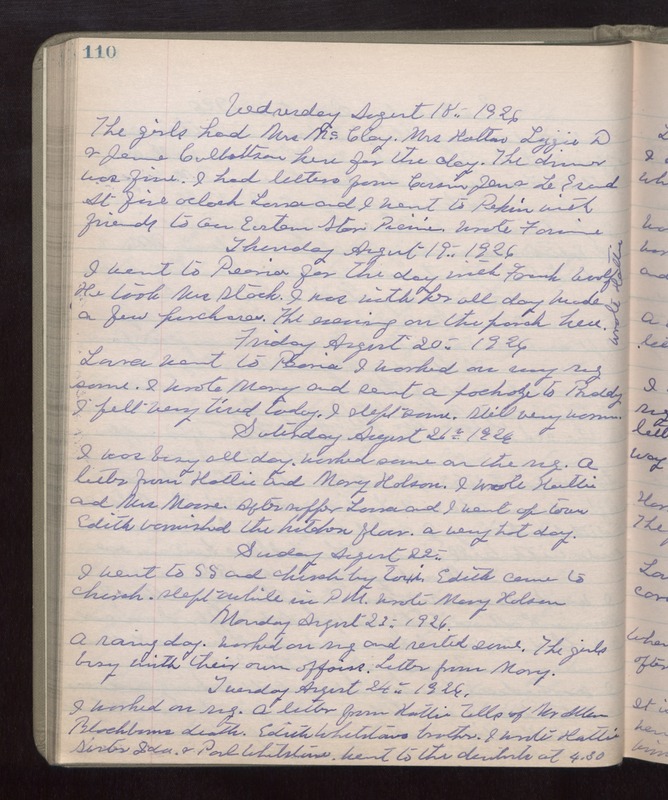 Wednesday August 18th 1926 The girls had Mrs McClay, Mrs Hatters, Lizzie D-- & Jenie Culbertson here for the day. The dinner was fine. I had letters from Cousin Jen & LeGrand. At five oclock Laura and I went to Pekin with friends to an Eastern Star Picnic. Wrote Fannie. Thursday August 19th 1926 I went to Peoria for the day with Frank Woolf. He took Mrs Stack. I was with her all day. Made a few purchases. The evening on the porch here. Wrote Hattie. Friday August 20th 1926 Laura went to Peoria. I worked on my rug some. I wrote Mary and sent a package to [Buddy?] I felt very tired today. I slept some. Still very warm. Saturday August 21st 1926 I was busy all day. Worked some on the rug. A letter from Hattie and Mary Holson. I wrote Hattie and Mrs Moore. After supper Laura and I went up town. Edith varnished the kitchen floor. A very hot day. Sunday August 22nd 1926 I went to S S and church by taxi. Edith came to church. Slept awhile in PM. Wrote Mary Holson. Monday August 23rd 1926 A rainy day. Worked on rug and rested some. The girls busy with their own affairs. Letter from Mary. Tuesday August 24th 1926 I worked on rug. A letter from Hattie tells of Mr Allen Blackburns death, Edith Whetstones brother. I wrote Hattie, sister Ida & Paul Whetstone. Went to the dentist at 4.30.